Raise open pallets to proper working height with this practical machine. 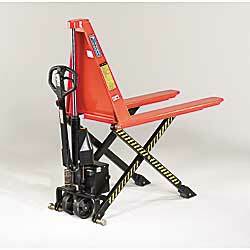 26.7"Wx45"L forks lift pallets from 3.332"H and support up to 2200 lbs. 180° steering arc. Other features include: ergonomic warm handle, polyurethane swivel and load rollers. Manual hand pump model requires 28 strokes without load and 62 strokes with load to reach maximum working height. 12V, DC battery-powered model has an 11-second lift time without load and an 19-second lift time with load. Includes battery and remote charger.